The open question is if the Ramos campaign and Carmelo Garcia are allowing or backing the effort? Supporting the pro-developer position is consistent with their support of Vision 20/20. HHA Executive Developer Carmelo Garcia claims he is the authority on approving any flyer distribution within the campus. Did Frank "Pupie" Raia get approval from the HHA? 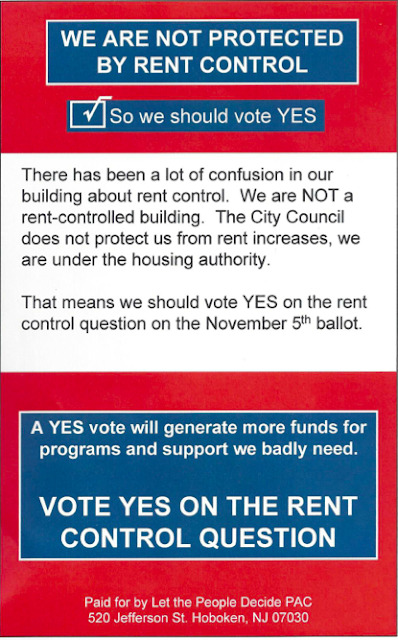 Distributors of the flyers are running completely amok across the downtown HHA buildings. Talking Ed Note: The flyer message is both interesting and effective. 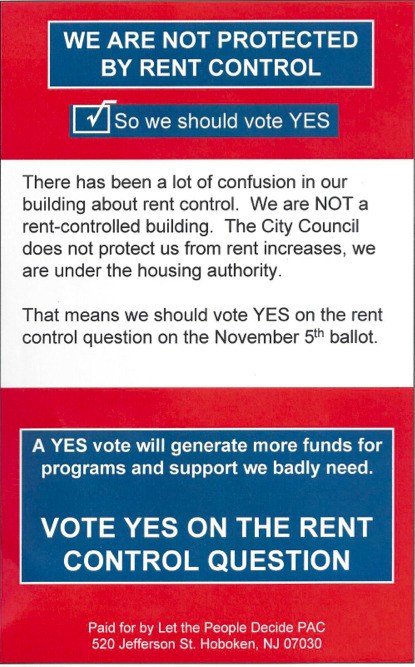 It's telling HHA residents rent control has no impact on them so doing away with it is beneficial by getting more "yuppie scum" money. Well you just knew that the Mason One Hoboken Team would show their true colors didn't you? This is the One Hoboken vision of Frank Raia and Beth Mason.